Awesome! Your new wall art from Scripture Wall Art arrived in the mail. You are so excited to get it up on the wall. But, wait, you have never done this before. No worries, we are going to walk you through it step by step. It’s very simple and after you do one, you will practically be a pro! Have you identified exactly where you are putting your wall art? You will want to choose a surface that is relatively flat. The smoother it is the better the decal will adhere. However, the walls in my house are very HEAVILY textured and I have tons of wall arts up. You can apply a Scripture Wall Art on many different surfaces. Mirrors, windows, and walls are the most common. We will be doing ours today on a wall since that is the most common application. So, choose your spot on the wall and give it a quick wipe with a dry cloth. We just want to get any surface dirt off. If you are installing in a kitchen or a bathroom you will probably want to clean the wall with a surface cleaner such as Windex. Often in wet rooms, a film can build up on walls. Make you let the wall dry completely before applying the decal. 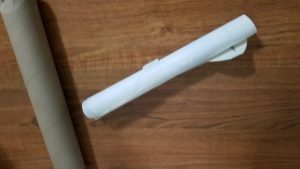 Now, your wall art arrived in a mailing tube just like the one below in most cases. Open one end of the tube and carefully slide the wall art out. You will find it rolled up and taped. Many other companies will fold their wall arts and mail them in an envelope. This saves them money but is not the right way to ship them. At Scripture Wall Art we always ship in a tube to ensure that your wall art arrives in near perfect condition. Untape the wall art, just the little piece of tape holding it in a roll. Carefully unroll it. It is best to either lay it flat and put some flat objects on it to flatten; however, you can carefully reverse roll it also. Perfect! We are now ready to apply the decal to your wall. Your Scripture Wall Art or vinyl wall decal is composed of three distinct layers. On one side the layer is called transfer tape and is basically a very large piece of masking tape. On the other side is what is called the backing paper. It has a more distinct paper feel to it. And there, sandwiched between those two layers, you can see your wall decal. 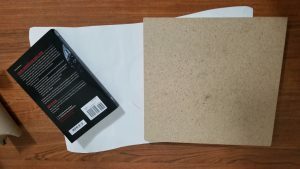 Basically, we are going to remove the paper backing, place the wall art on the wall with the transfer tape, and then peel off the transfer tape. So, let’s do this. And please remember we are only an email away. If you run into any difficulties just drop us an email at scripturewallartsales@gmail.com and we will help you through it. Place the wall art on a flat surface with the tape side down and the paper side up. 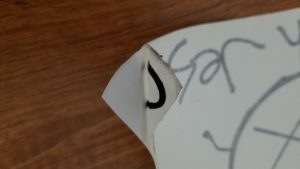 Separate the tape from the paper at a corner like below. 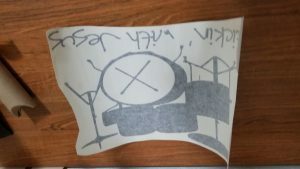 Please note I flipped this over for the picture but you will peel the paper off with the wall art flipped the other way. Slowly peel off the back paper at about a 45-degree angle. Just go slow and steady carefully watching to make sure the decal is staying on the tape. 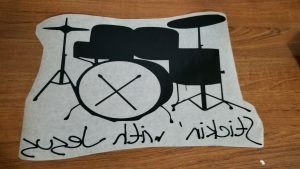 Occasionally a small piece of backing paper with rip and stay on the decal. Do not worry about that now but we will need to pick it off later. (this doesn’t often happen). When you are done, your wall art will look like this. Yes, it should be backward. It will go on your wall and be forwards when you see it. Now, you can just carefully pick up the wall art and stick it on the wall where you want it. It is rather sticky so be careful. Make sure you align it right where you want it. Typically you only get one shot at doing this. You may want to pre-mark your wall to ensure it is level. Depending on the wall art, this may or may not matter. Now, you have the wall art up and still covered with the transfer tape. You are almost done with your vinyl wall decal installation. You want to rub the wall art down on the surface with good pressure. Many times you will see it is recommended to use a small flat tool such as a credit card to apply the decal. In most cases, this is bad advice. Many companies even include a tool but this creates many problems. The flat tool only works if your surface is completely flat. 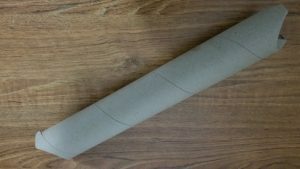 On any surface that has any texture, the flat tool is a mistake. Since most walls are textured, we do not recommend using a tool of any type. Personally, I just rub the decal down with my palm. the palm is firm enough to apply good pressure but also soft enough to help get the wall decal into the low spots of the texture. Just rub the whole thing down really well. Now, start at one corner and slowly start removing the transfer tape. Basically, the stickiness of the decal is greater than the stickiness of the tape. So the decal is going to want to stay on the wall. However, depending on the amount of texture your wall has and also the type of paint, the wall art may or may not want to adhere well. In this example, I was installing on a glossy wall. Wall decals do not adhere well to glossy walls. Most glossy paint is designed so that dirt and such won’t adhere making the walls very easy to clean. If the decal wants to stay on the tape, just slowly rub that spot back down really well and pull the tape very slowly while sliding your other hand over the decal. Slow and steady is the key here. If you notice a spot that came just slowly rub it back down. Please note, that it can be easy to not notice that a period or something didn’t stick. You may not see it until the tape is completely off. No worries, That little dot can be taken off the tape separately and stuck on the wall manually. Now, you are pretty much done but if you had a hard time getting the wall art to adhere you will want to carefully rub the wall art down with your palm. 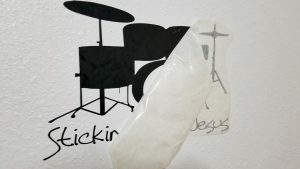 This will ensure good adhesion and a longer life for your wall decal. Your vinyl wall decal installation is complete. Don’t forget, if you need help, just send us an email at scripturewallartsales@gmail.com. Wanna do us a favor? Just share this article to your Facebook page, Twitter, Instagram, Pinterest, or Google Plus using the buttons to your left. That really helps us and we appreciate it a great deal. Thank you in advance. Please leave us any comments or questions below. Thanks John, we just love it when people share our information. Thanks so much for stopping by our site. Thanks Stephanie, I appreciate your kind words. If you don’t see what you are looking for make sure to shoot us an email and we will find it for you. Really easy to follow these instructions. You have me interested. I am going to check out the shop! Thanks Dustin, Wall arts are very easy to apply and look hand painted on the walls when they are done. Thanks so much for stopping by our site. I always had problems with the untaping art when I helped my little cousin to do it. Thanks to this explanation. I hope we can do it better the next time. And do you have any suggestions for this for total beginners? The biggest factor is the surface you are putting it on so it is difficult to offer suggestions without more information. 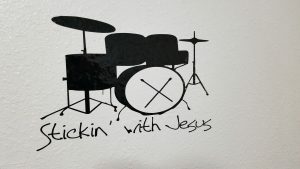 However, this may sound self serving but hear me out, always buy your vinyl wall decals from us here at Scripture Wall Art. This is for one simple reason…we are the only company that I know of that actually guarantees your installation. So, if you have a problem and destroy the product trying to put it up, we simply send you another at no charge. Things happen and we understand that. So you can always buy with confidence from us. Great people to work with! 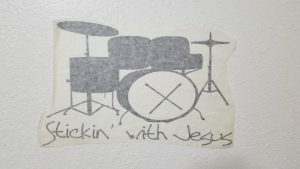 Just purchased my first and most definitely not my last decal from Scripture Wall Art! Thanks so much, Chuck for the kind words. It was great working on your custom wall decal. I am grateful that you found us. I look forward to working with you in the future. just wanted to share a special story of my wall art, my youngest grandson, now 19 and in college, sooo proud of him! We have a very special verse on our non-profit for at-risk youth and families in the Flint, Michigan and surrounding area, Isaiah 58:12 about “restoration”! He surprised me at Christmas with this verse, I am putting up in my living room, GOD bless! Thank you so much for sharing your story. Vinyl Wall Decals really can touch lives on a daily basis. God Bless You Too.